The look and texture of real stone adds beauty and elegance to any interior or exterior space. 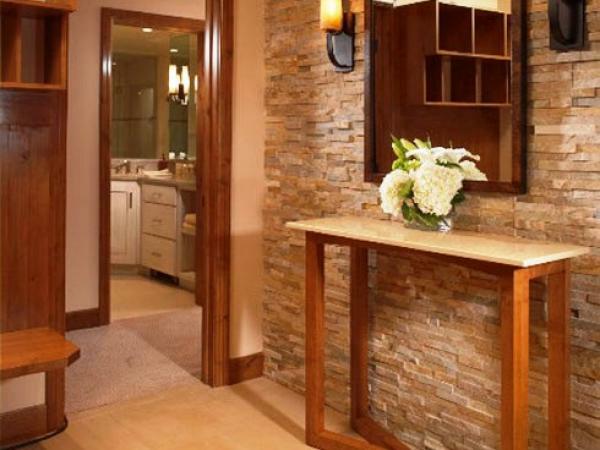 In a family room, bath, kitchen, or any outdoor living area, natural stone veneers can simultaneously radiate a cozy lodge-like feel while presenting a real impression of luxury. When cladding with an authentic stone veneer, beauty, durability, ease of application, and reasonable cost are important considerations for any new or remodel project. Natural stone veneer is a viable option for many indoor and outdoor applications. Products are available in a wide variety of colors, textures, and shapes that are ideal for interior and exterior walls, fireplace surrounds, and outdoor living areas. Natural stone veneers and tiles are extracted from quarries throughout the world. Varied geographic sources and geological conditions in China, Turkey, Africa, India, and the United States account for a full spectrum of colors, textures, and designs. The natural stone has been cut into a range of styles and shapes to facilitate easier application. The most popular natural stone types include slate, limestone, marble, ledgestone varieties, and travertine. Textures may be smooth for an elegant finish or roughened or split-faced to emit a more rustic flavor. Depending on the choice of natural stone, shades may range from white to virtually black with reds, browns, rust, grays, tans, and cream in between. PetraSlate even offers a stone product that replicates the look and finish of natural wood. Unlike natural stone that once had to be cut and shaped on-site to create a natural wall or fireplace cladding, PetraSlate veneer products are carved, not fabricated, into pieces that can be placed easily, Natural stone veneer pieces vary in weight and dimensions depending on the desired style. A Ledgestone piece might be 4” x 12” and weigh about 7 lbs. A Travertine array may have differing shapes to create a recurrent theme and weigh between 6 and 10 pounds per piece. The options are limitless. But veneer installation is far less complicated than whole stone, yet just as durable. PetraSlate Tile & Stone is a top quality purveyor of the world’s highest quality natural stone veneer products. Depending on your preference and application, PetraSlate has the right product for any job. Beautiful, durable, and economical, PertraSlate’s world class products are available in an extensive range of options for any room or exterior space. Call PetraSlate in Denver for ideas regarding upcoming projects. Whether you seek expert advice for product suggestions or directions for application, the experts at PetraSlate will be glad to help. Visit the PetraSlate website or call the cladding experts at 303-280-9595.